Femelle de Acanthodactylus aureus. Gourizim. Photo: © Mario Schweiger. Mario Schweiger (2012): Acanthodactylus aureus Günther, 1903. Au: Martínez, G., León, R., Jiménez-Robles, O., González De la Vega, J. P., Gabari, V., Rebollo, B., Sánchez-Tójar, A., Fernández-Cardenete, J. R., Gállego, J. (Eds.). Moroccoherps. Amphibiens et reptiles du Maroc et au Sahara occidental. Disponible à www.moroccoherps.com/fr/ficha/Acanthodactylus_aureus/. Version 13/10/2012. Consulté le 25 Apr 2019. Aire de répartition de Acanthodactylus aureus. 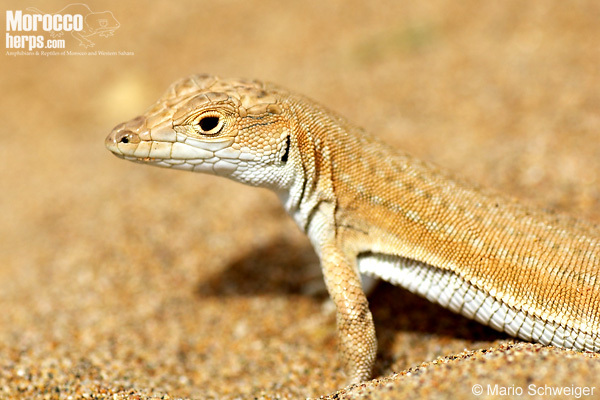 The scientific name aureus probably doesn´t point to the "golden" colour of the lizard, but is named of the locality of its first observation, the "Rio de Oro" (gold river) peninsula west of the gulf with the same name (Western Sahara). Günther had only preserved specimens, collected by Mr. Riggenbach, which, as I suppose, didn’t show the “golden” breeding colours. Crochet et al. 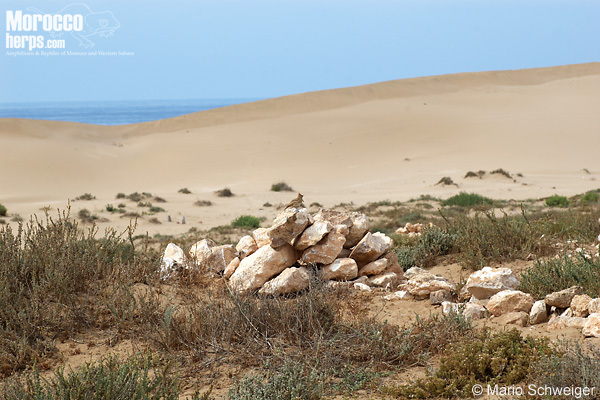 (2003) restricted the Terra typica to Dakhla on this peninsula, although the types came from this area. Acanthodactylus aureus is a member of the scutellatus group. No other member of this group (A. dumerilii, A. longipes, A. senegalensis, A. taghitensis) shares the same distribution (with exception of A. dumerilii in the Semara area), therefore a missidentification with another species is probably not possible. The only other two Acanthodactylus species, living close by at least are A. boskianus and A. “busacki”. Female of Acanthodactylus aureus. Gourizim. Photo: © Mario Schweiger. In Acanthodactylus boskianus the dorsal scales get visible larger from the neck to the tail, therefore easy to determine. Acanthodactylus “busacki” has distinct large blotches, with or without longitudinal stripes. The snout of A. aureus is much more pointed in contrast to A. “busacki”. Blotches and stripes have a much more faint appearance in A. aureus. Juvenile of Acanthodactylus aureus. Tarfaya. Photo: © Gabri Mtnez. Why Acanthodactylus “busacki” is written here within quotes, see taxonomical account of that species! In Acanthodactylus aureus, in very most cases, only 2 Supralabials have contact with the Subocular, a result of melted 3rd and 4th, seldom 4th and 5th Supralabials. Hind limb showing the scales on fingers. Tantan. Photo: © Gabri Mtnez. 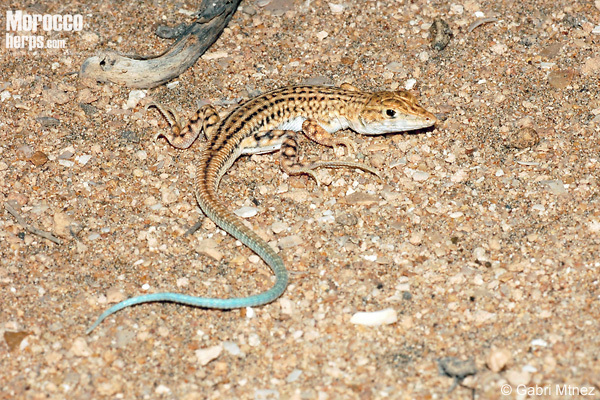 A day active lizard, which may be active also during cool, overcast weather (Schleich et al., 1996). Runs very quick from one bush to the next, when encountered. Acanthodactylus aureus is hiding inside bushes or in holes in the dunes (digged by ?) (Boettger, C.R. ; own observ.). We never could find them below the rare stones in the dunes. 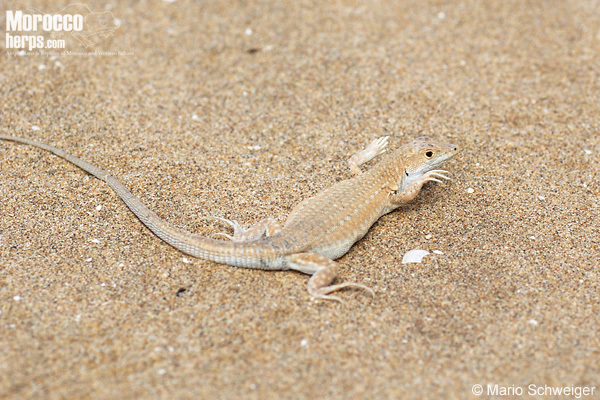 During sunshine the lizard is basking for a long time on the hot sand. 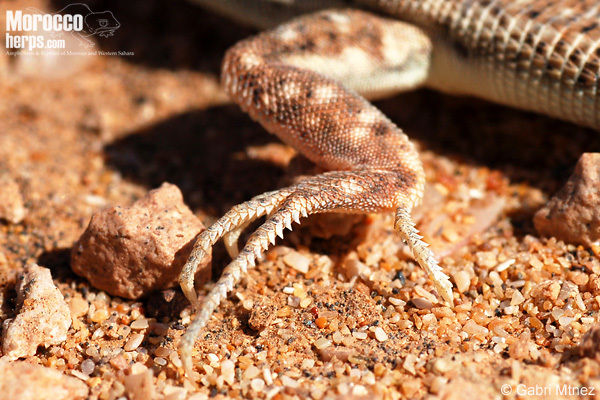 To avoid burnings on feet and belly, it changes the basking position from belly on ground with feet up in the air to belly up the ground as high as possible, regulary. 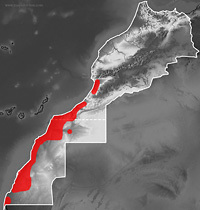 Limited to a narrow stripe along the Atlantic littoral from Agadir, Morocco in the north to Mboro in the Senegal (Böhme, 1978; Brito et al., 2008). Most inland location is Semara (Smara) in Western Sahara (Crochet et al., 2003, Geniez et al., 2004). Restricted to sandy habitats with warm to hot winter climate (Geniez et al., 2006). Habitat of Acanthodactylus aureus. Gourizim. Photo: © Mario Schweiger. 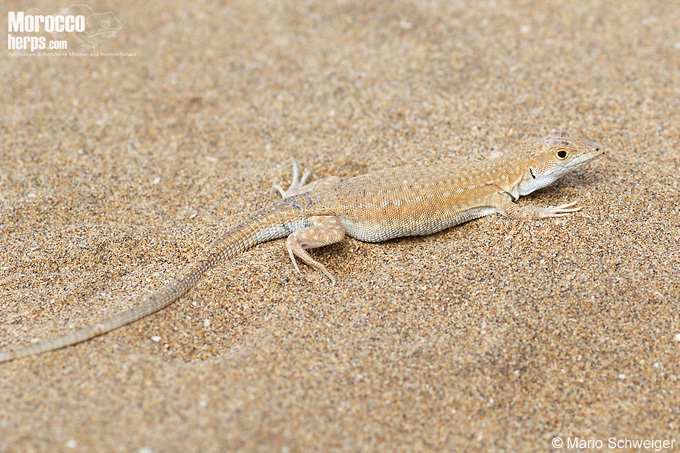 We observed Acanthodactylus aureus in the coastal dunes south of Agadir between Tifnite (west of Sidi-Bibi) in the north and Sidi Ifni in the south. We only saw them in the open dunes close to the coastal line with no to very sparse vegetation. 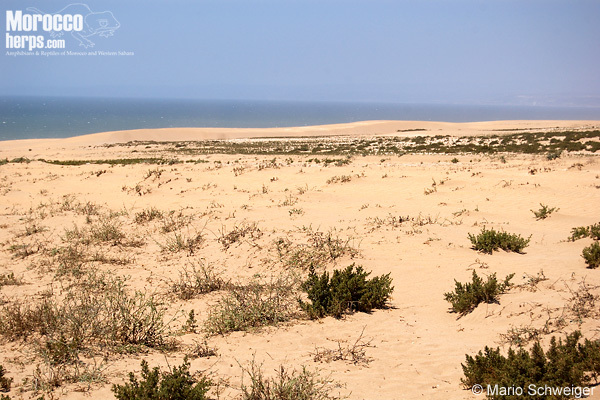 More land inside, where the dunes have been covered with dense vegetation, A. aureus was replaced by Acanthodactylus “busacki”. We never could observe both species syntop, although they are living close by, sometimes only separated by a few metres. Habitat of Acanthodactylus aureus. Tifnite. Photo: © Mario Schweiger. At Gourizim the abundance seemed to be very high during our visit in contrast to other localities (artefact of daytime?). Distance between specimens has been 5 to 10 metres. Günther (1903) and Boettger (1921) also report a very high abundance on the Ed Dajla es Sahria (Rio de Oro) peninsula.